It might be a tiny bit misanthropic, but the nicest time on a college campus is the summer. Libraries are empty and all of the study spaces are clean, outdoor seats are always free, and you can see the buildings without crowds or anyone canvassing for student elections. Sure, you’re missing the best part of education (yes, the part where students learn! 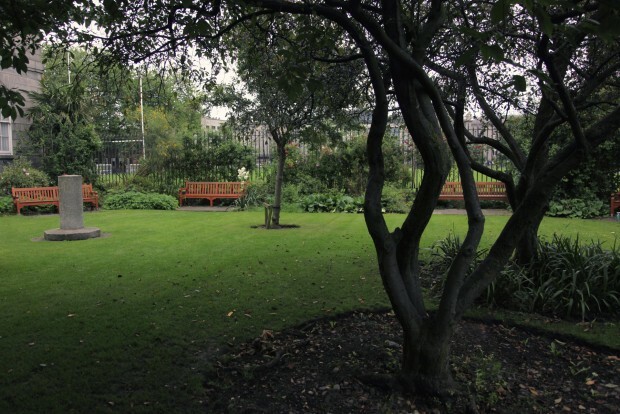 ), but in exchange you get big, peaceful spaces around the city. Except maybe in Trinity College, where the location and the tourism draw ensures there’s a steady flow of visitors to replace the lull in the undergraduate population. The Rose Garden is located between the end of Woodward and Deane’s Museum Building and its perpendicular neighbour, the number 40 block of New Square housing, with open space (the rugby pitch and College Park, with the cricket crease and running track) behind railings on the other two sides. The path into New Square is the only open side, and even this feels somewhat enclosed thanks to the large cherry blossom tree planted nearby. Even as photographed, on a dull day after the blossoms had gone last year, the tree still creates a fourth border. 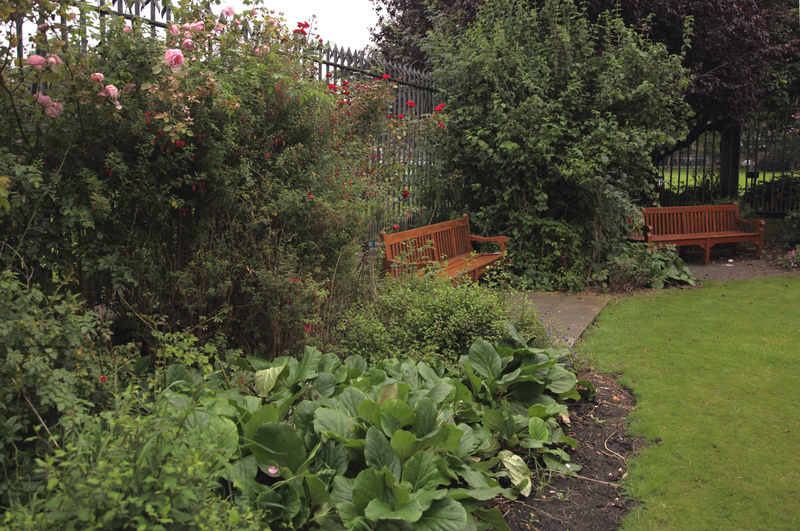 Even at peak student population, you’ll sometimes have the Rose Garden to yourselves. The well-spaced benches and domestic-style planting make it feel sweeter than a park or public space. If your romantic life involves macaron picnics rather than nervous, ambiguous trips to Yamamori or wretched 3am bravery, this has to be among your Dublin highlights. In memory of Donald Ernest Wilson Wormwell FTCD (1939-1978). Presented by his wife Daphne and family. In memory of John Hoban BAI (1943). Presented by Kevin Hoban and Desmond King. 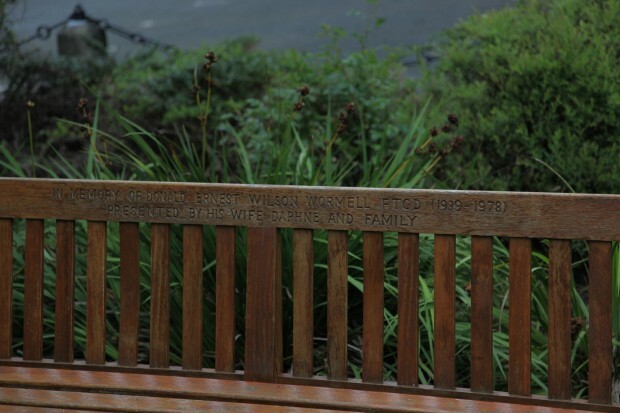 There’s a nice quality to the bench as a memorial, contributing a low-key amenity for people to enjoy whether the name means anything to them or not, much better than an explanatory plaque that does nothing but explain. Grouped together around this small green space, the benches are undoubtedly telling a story about Trinity that I’m missing in my UCD/DIT ignorance, and I still get to feel fond of Phyllis Grehan and John Hoban. I’d be even more keen if they were less standard and more tactile – there’s a beautifully crafted memorial bench at the School of Architecture in UCD that comes to mind – but perhaps that didn’t suit either Trinity or the memories.